I sit here writing this post grateful for the fact that I have the electricity to run this laptop, for so many of my neighbors here in Myrtle Beach are without power… and are unsure if they will have any at any point in the next week. This area is absolutely no stranger to hurricanes. A category one hurricane here is comparable to a run of the mill nor’easter back in Vermont. Sure, you fill your bathtub with water and check your flashlights for fresh batteries. But mainly you just hunker down with some snacks and wait for the storm to pass, relatively confident that it will do so with little more than the inconvenience of flickering lights. So the fact that so much destruction has been caused in the Grand Strand area by a category one hurricane has been a shocker to most of us. 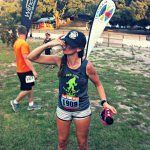 Last week when we first heard that we were in the line for a possible direct hit from Hurricane Matthew, my first thought was “what about our Ragnar Trail Relay?” I’m telling you, my priorities are pretty messed up. But to give myself some credit, my kids were scheduled to be with their dad, and Geoff and I live in what is called “Hurricane Zone C”…i.e. the least likely place here on the beach where destruction from a hurricane might occur. But after stalking the Ragnar Trail Carolinas Facebook event page and determining that the event would NOT be canceled (they were far enough inland to hopefully avoid any damage from the hurricane) 5 out of 8 of our teammates (and 6 out of 8 of our other Myrtle Beach Ragnar team) packed our bags and headed to Fort Mill, South Carolina, ready for an adventure. 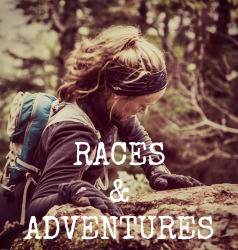 Adventure, as it turns out, would be a bit of an understatement. This recap is not what I hoped it would be. The story doesn’t flow, the pictures aren’t very good, and I find myself struggling to put the experience into words. 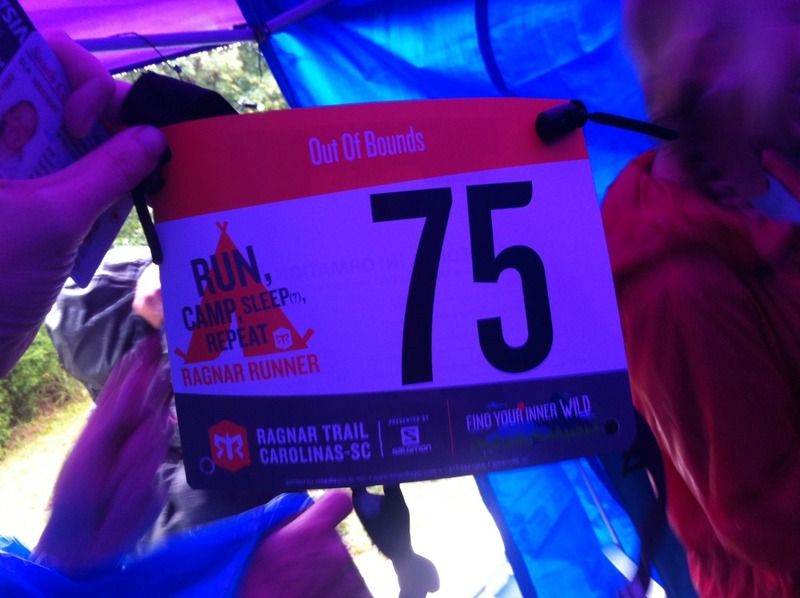 But it only seems fitting, as the Ragnar Trail Relay was also not what I hoped it would be. That’s not to say that our Ragnar experience was bad. Wet and at times dangerous, sure, but certainly not bad. It’s funny how often times we picture a race or an event turning out in a specific way, so when it doesn’t end as we had imagined, there is a feeling of disappointment. And I would be lying if I didn’t admit that I felt a little disappointed with how our Ragnar experience turned out. But further introspection often reveals that even though things didn’t turn out the way you hoped they would…they still turned out pretty damn well. The effort put forth by my amazing team this weekend was incredible. And the laughs we all shared despite the miserable conditions? Those moments are absolutely priceless. 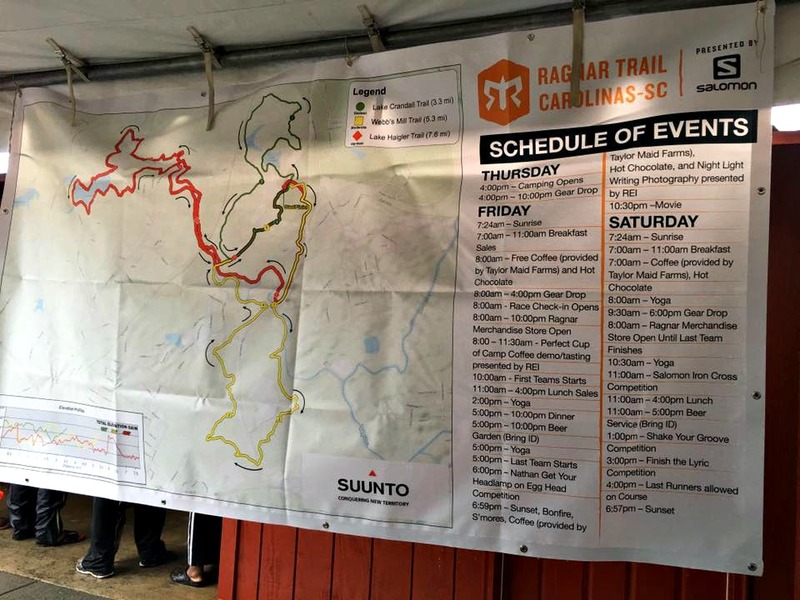 Because Geoff had to work a full day on Thursday, the two of us were the last to arrive to Anne Springs Close Greenway, the location of Ragnar Trail Carolinas. But our amazing friends had not only already set up our dual-team compound consisting of tents, tables, and chairs, they had a Bachelor/Bachelorette party theme already going for us when we arrived. We were handed amazingly gaudy Groom and Bride to Be glasses, a sash and a ring pop for me, and a “scavenger hunt” list for each of us to complete over the weekend. It meant the world to me that these friends made these simple but awesome gestures to help us celebrate our upcoming wedding. I don’t think in the chaos that was about to ensue, I was able to take the time to truly thank them for that. So…thank you, my friends. After a lot of giggles and a drinking game called “everyone take a sip every time Daniel picks up a new, different snack” (that guy sure can put away some snacks), we eventually all headed to bed, excited and nervous for what the following day will bring us. Here’s a hint: it was going to bring rain. I woke up in the middle of the night while having a dream that I was giving a lecture in a classroom. I was in the middle of asking students to raise their hands if they ate salsa. I have no idea what the topic of this lecture was, but clearly my affinity for Mexican food was shining through in my dreams. As I was counting the hands raised one by one, I woke up to realize that my “counts” were coinciding with drops of water bouncing off of my forehead. I laughed, because it was a hilarious situation, both the raindrops and the dream itself. I hunkered down further into my sleeping bag, still giggling, and hoping we would make it to daylight without being completely soaked. Eventually, my internal alarm clock let me know it was time to wake up, and I tiptoed out of the tent to find a gloomy, rainy, wet campsite. My fellow teammates started to trickle out of their tents as well. It was entertaining, to say the least, to watch about 8 people crammed under one “easy-up” tent in the rain, trying to figure out how to make coffee on a propane camp stove…especially when both the water and the coffee could not be located. I know our neighbors to the left, self proclaimed backpackers, were highly entertained by our antics. 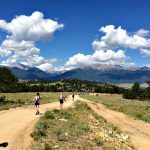 (I know this because I overheard them talking about the difference in the ammount of “stuff” required between backpackers – them – and “base campers” – us – while staring in our general direction. We were indeed a chaotic sight to behold. ) But have no fear, two of our missing campers had NOT gone to sleep in their van, as we had previously suspected, but instead had ventured back out into the real world to find a Dunkin Donuts, eventually returning with a giant “Box of Joe”. American runs on Dunkin, indeed. Heather fun fact: I don’t drink coffee. But I can relate to the inability to function first thing in the morning without some source of caffeine. The smiles of the happily caffeinated. 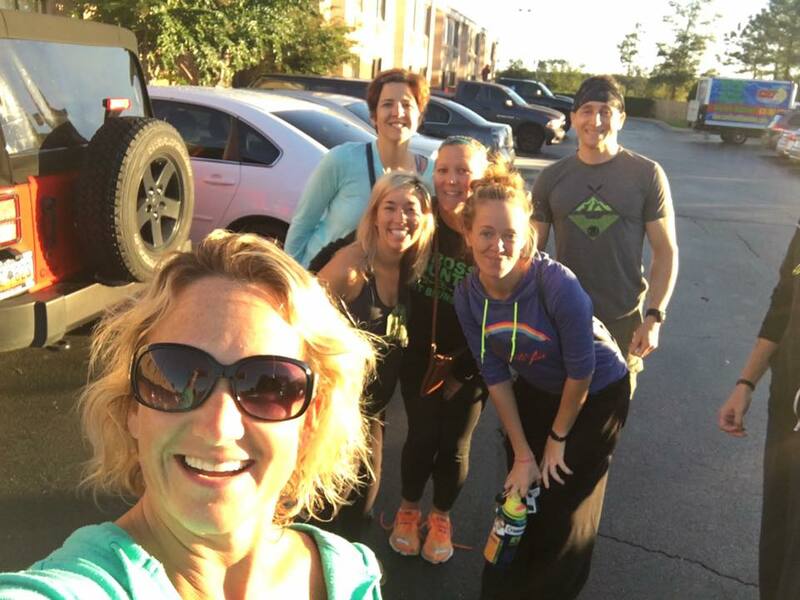 Eventually, the other team’s captain (Julie), Emily, and I headed into the Ragnar Village to try and get our team checked in. We were first required to watch a 13 minute safety video, which was equal parts cheesy, hilarious, and informative. 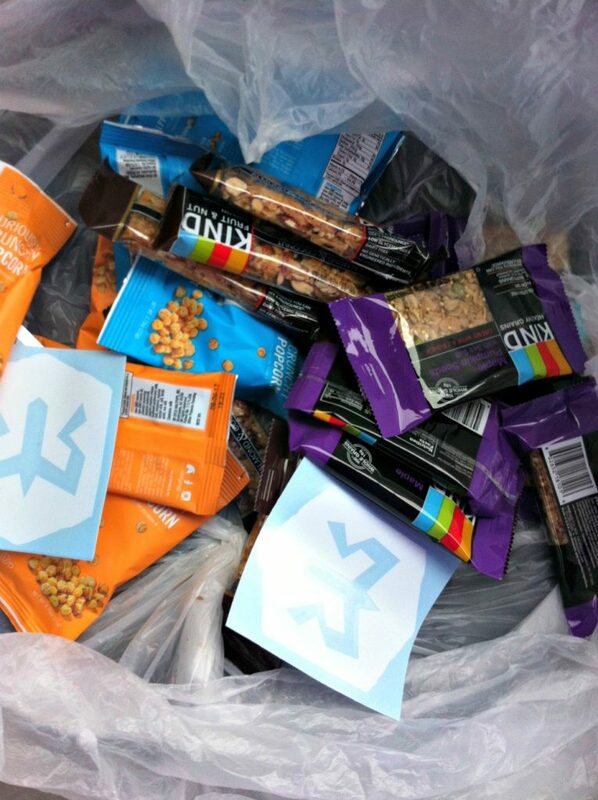 We then picked up our teams bibs, snacks, and t shirts. I informed the woman at check in that 3/8 of our team was missing, and she said it was not a problem, and further, we would just get to eat all of the missing team members snacks. Dear teammates that didn’t make it: we missed having you there. We definitely ate your snacks. Giant goody bag full of KIND bars in hand, we next headed over to check out the vendors in the village as best as we could while tiptoeing between the raindrops. Salomon was there with tons of shoes on hand and ready for demoing, as was Suunto. ENO tents was present, Kleen Kanteen, Nathan Hydration, REI, and Goal Zero. I wish I had the opportunity to talk to the reps and check out their gear (I won’t lie, I’m trying to woo Nathan. So much so that I’m shamelessly mentioning in this post that I want to work with them. They play hard to get.) but the rain made this nearly impossible. 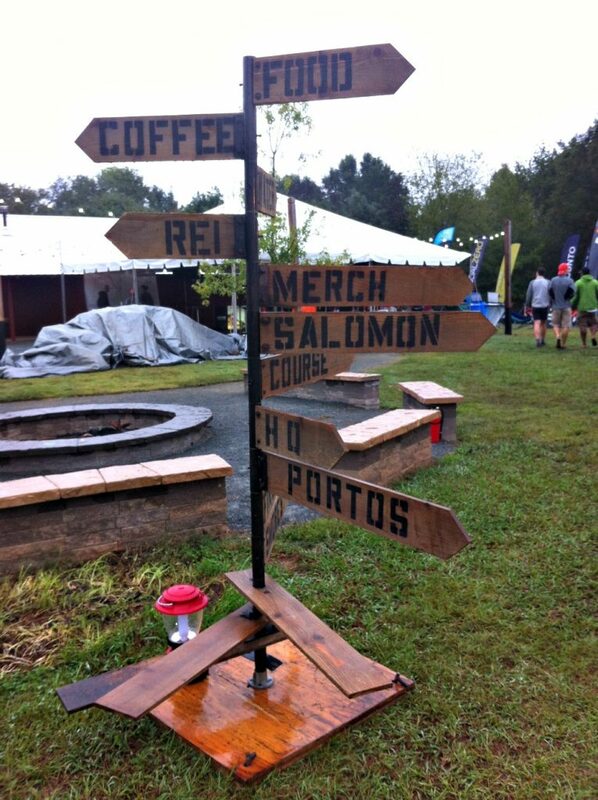 The dry and covered Ragnar merch tent was hopping AND tempting, I had to remind myself a dozen times that I don’t need more “stuff” in my life. 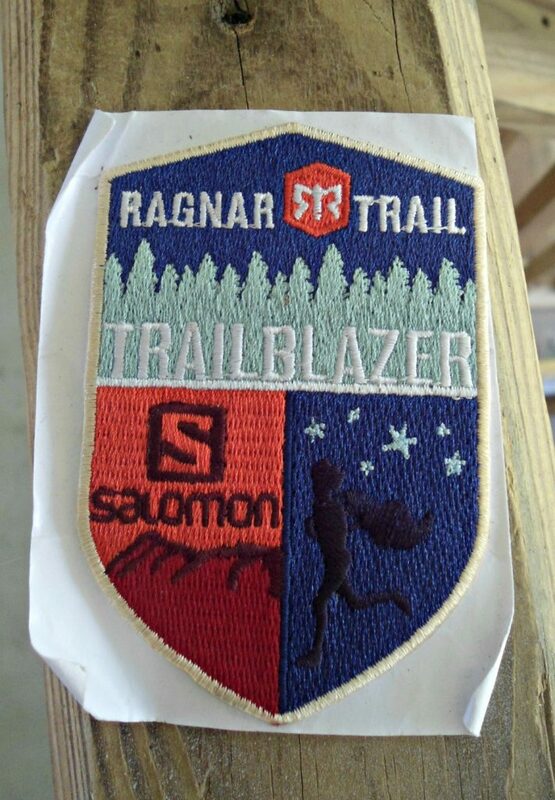 I settled for a cool little Ragnar Trail patch. Memories > material items. Though the race started at 10:00 am, both of our teams were not slated to start until 12:30. The rain was picking up in intensity, and was unrelenting. Turns out, we wouldn’t be spared the effects of the hurricane after all, despite being over 150 miles inland. So we spent the majority of our morning strapping tarps across all of our leaky tents to form something that resembled more of a compound than a campsite. It wasn’t pretty…but it was pretty functional, and that’s all that matters. So let’s get to the race, shall we? 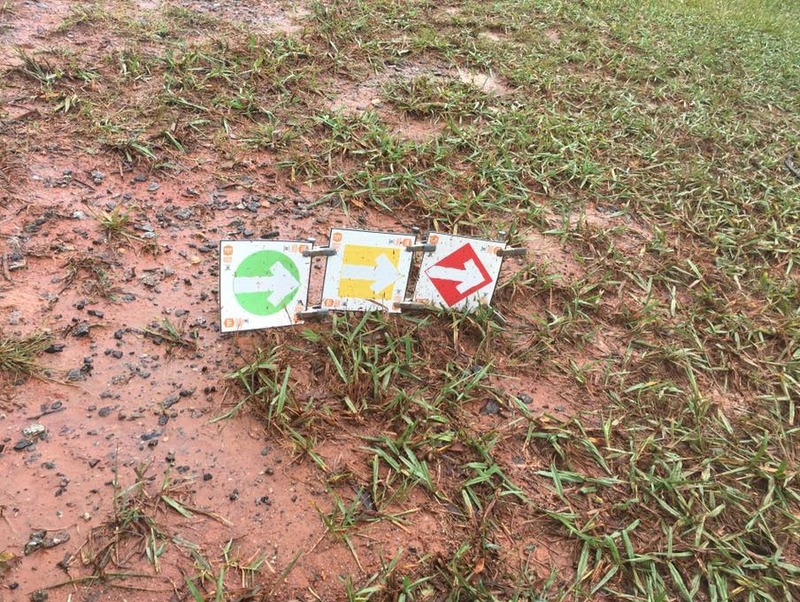 Ragnar Trail Relays work very differently from the standard road Ragnar Relay. 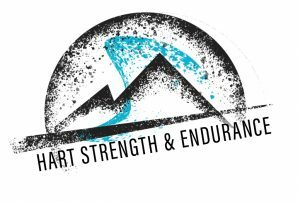 Intead of a point to point course where teammates take turns running the course while the rest of their team travels by van, Ragnar Trail Relays consist of loops that start and finish at base camp. There are three loops: green, yellow, and red, that vary in length and difficulty. Over the course of the two days, all eight members of your team each run all three loops, for a grand total of 129.6 miles (on this course). Our team, being shy nearly half of our runners, would be doubling up on mileage. Now, Ragnar requires that each team provide a volunteer. 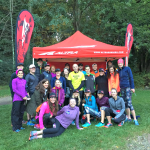 At Ragnar Trail, anyone on the team can be that volunteer. Being team captain, I stepped up to the plate, and also chose one of the very earliest volunteer slots I could find, so that I could get my volunteer duties out of the way. Not that I don’t enjoy volunteering, but I wanted to not have to worry about the logistics of balancing the running portion with the volunteer portion. My volunteer duties included helping runners at the transition point, both with swapping their bibs, colored slap bracelets indicating the leg they were running, and keeping all of those that weren’t about to transition OUT of the transition barn. I spent 3.5 hours watching runners come back into transition, utterly soaked, covered in mud, looking disheveled, and some, looking nearly traumatized. It was nasty outside, but without fail, people kept running. It was incredible to see the grit and determination in all of these runners. It also left me with a tiny bit of “this is going to be ugly” hesitation, knowing my turn in the rain was just around the corner. Around 5:50 pm it was finally time for my first leg. Geoff and I decided to “pace” each other and put in all of our laps together, as it would be great training for One Epic Run later in the year. We set out for our first loop: 7.6 miles on the “red” course. The rain had let up for the most part, and the drizzle was hardly felt in the shade of the trees. Despite the fact that the impending hurricane had temporarily loosened his grip, I chose to leave my camera back at the campsite, vowing I would take pictures the next morning. 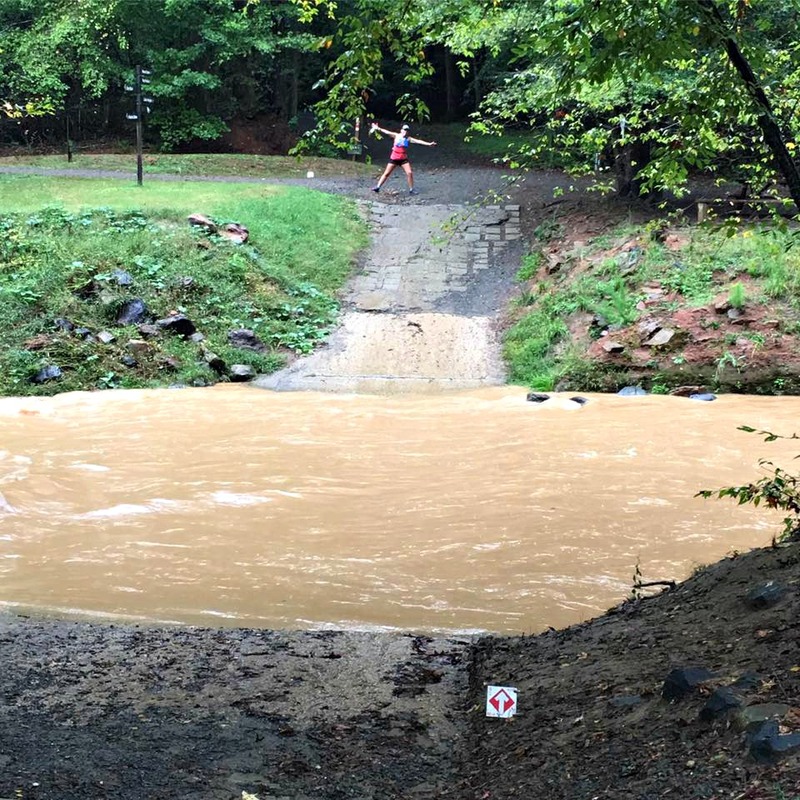 The red course was GORGEOUS…albeit soaked. The dim lighting in the woods caused the leaves to nearly glow. The single track that ran along the stream was breathtaking. And the swing bridges? They were so cool, I felt like a little kid running across a playground. Thankfully, some of my teammates got a few photos, so you’re not going to simply have to take my word for it. I also ran the first loop in my “Bride to Be” sash. But … this is the only photographic evidence. 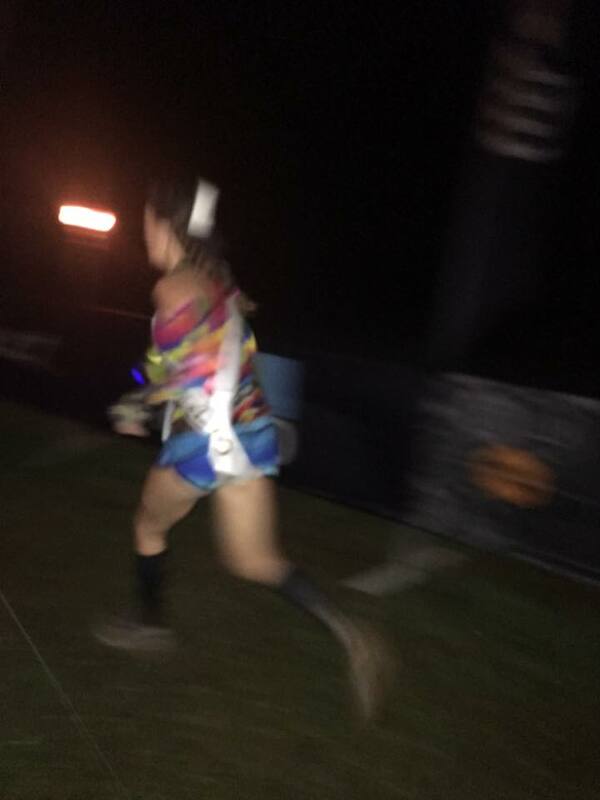 In fact, this is the only picture of me running during Ragnar, period. I’m like the elusive Bigfoot. But I promise I really was there. Geoff and I had 16 miles to cover on our first three loops, so we went out at a moderately conservative pace. Had I known this would be our only TRUE run of the day, I probably would have run a little faster. But you know, hindsight is 20 20, or whatever. We finished the first 7.6 miles without much issue, other than the fact that my stomach was utterly REVOLTING for all of the road trip/race day/evacuating from a hurricane junk food that i had put into it over the previous 48 hours. How many decades am I going to be suffering from my poor nutrition before I finally do something about it? The world may never, ever know. Geoff and I passed through the transition barn where we confused the volunteers a bit by swapping our bib, trading slap bracelets, and heading back out on the course together again. We were headed for the 3.3 mile “green” course. The easiest course, in theory, had already gained the reputation of being the WORST section out there due to thick mud that made the course nearly un-runnable. As it would turn out, this reputation was not unwarranted: we ran maybe two thirds of the course, and slid our way through the other third. 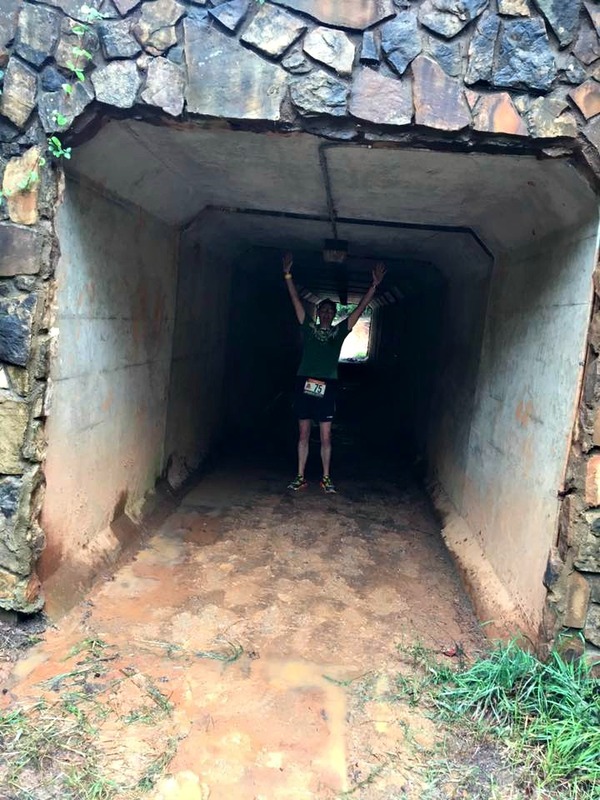 At this point it was pretty dark, so I couldn’t tell you much about the course, except it was incredibly muddy. But, the 3.3 miles passed quickly, and before I knew it, we were transitioning to the yellow/5.3 mile course. Cold, wet, and dark…that’s all I really remember about this one. 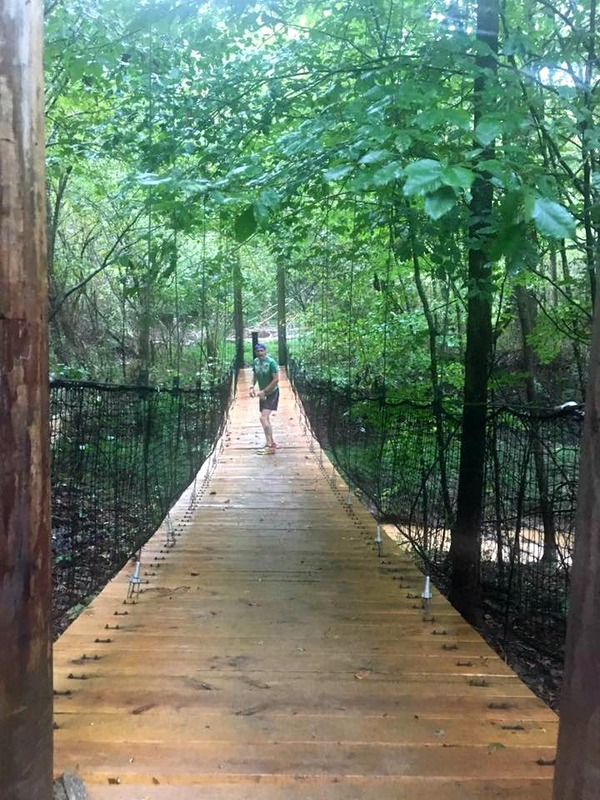 That, and I realized by this point that my future husband is a heavy stepper…as crossing the swing bridges with him had me fearing I was going to go flying over the railing, and then left feeling like I had vertigo. 16+ miles down for our team, Geoff and I made a mad dash for the last remaining food truck before they closed at 10:00 pm. Falafel never tasted so good…thank you Ragnar for including some killer vegetarian options. I was so incredibly hungry and craving “real” food, that I shoveled my falafel in so fast, I didn’t’ even take a picture of it. 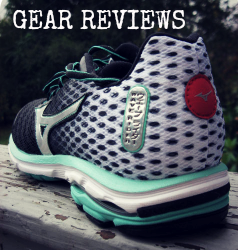 Blogger mistake #3. We headed back to the tent, changed into dry clothes, and tried to get some sleep. By my estimations, we had about 6 hours before Geoff and I would have to head out for our next 16 miles. Except, as the rain picked up in intensity…so did my teammates. Before I knew it, I heard Paul telling me it was time to get up, as it was nearly our turn again. I hadn’t slept…at all, if we are being honest. But the warmth of my sleeping bag allowed me to close my eyes and rest, and that was good enough to leave me feeling refreshed. As I started to mull about the tent, Geoff informed me that his ankle, which he had sprained about a week prior, had once again swollen to the size of a grapefruit. He was out. After a mild panic about how I was going to cover the next 32 miles the two of us were committed to by myself, I found myself calmly OK with the situation. One step at a time, one way or another, my team would get it done. I got on a fresh, dry running outfit, socks, and shoes. But just as I was getting ready to step out of the tent…the whole thing collapsed on top of me. At some point water had begun to pool on the tarp (we were diligently keeping track of it previously) and the weight of it caused one of the tent poles to collapse. Luckily it didn’t break, so the tent was able to be fixed. However, my dry shoes were now wet. Oh well, no sense in delaying the inevitable. 4:44 am. I knew the exact time, because I snuck in to take a peek at the clock on the laptop used to display the team names headed in for transition. As I stood waiting, a local friend (who was not on one of our two teams) came up to chat and check in on me. She had just returned from urgent care in town, where she had spent time having gravel picked out of her legs after a nasty fall. 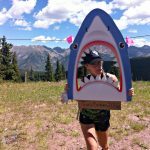 She told me that the Ragnar people had told her team to not worry about trying to make up her distance, in fact, they were encouraging people to each finish their own laps and call their race. I felt compelled to head over to the information tent and have a chat with them myself. The staff member at the tent basically told me: “It’s getting dangerous out there, don’t be stupid.” They didn’t want anyone out there to get hurt, and they were actually happy to see people pulling their teams from the race. He told me that they would give our teams medals if we had each completed our distances, but that it was ultimately up to us. I headed back to transition, waiting patiently for my teammate Raquel to show up. She ran in with Betsy, a teammate from our other team. I told them the latest news, and sent them back to the team tents with the information. In the meantime, I headed out for another 5.3 mile lap. At this point, it was pouring. Who am I kidding, I should say “it was pouring STILL”. The wind gusts were picking up, sending sticks and pinecones flying. 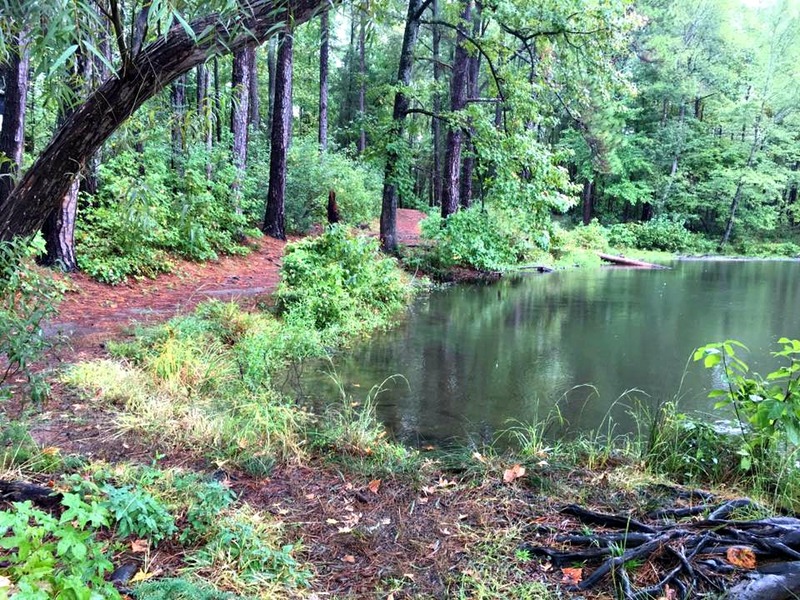 Standing water was easily ankle to shin deep in places, and the trails were no longer recognizable. I could barely run 5 steps without nearly loosing my footing and falling, so my running became incredibly infrequent. At some point, Daniel and Sara from the other team caught up to me, and we ran together. I was incredibly grateful for this because…my headlamps BOTH died. We picked our way through the 5.3 miles, running when we could, which unfortunately wasn’t very often by this point. 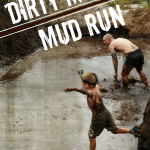 Now, as a (former) avid obstacle course racer, I feel pretty experienced in the world of running in mud. 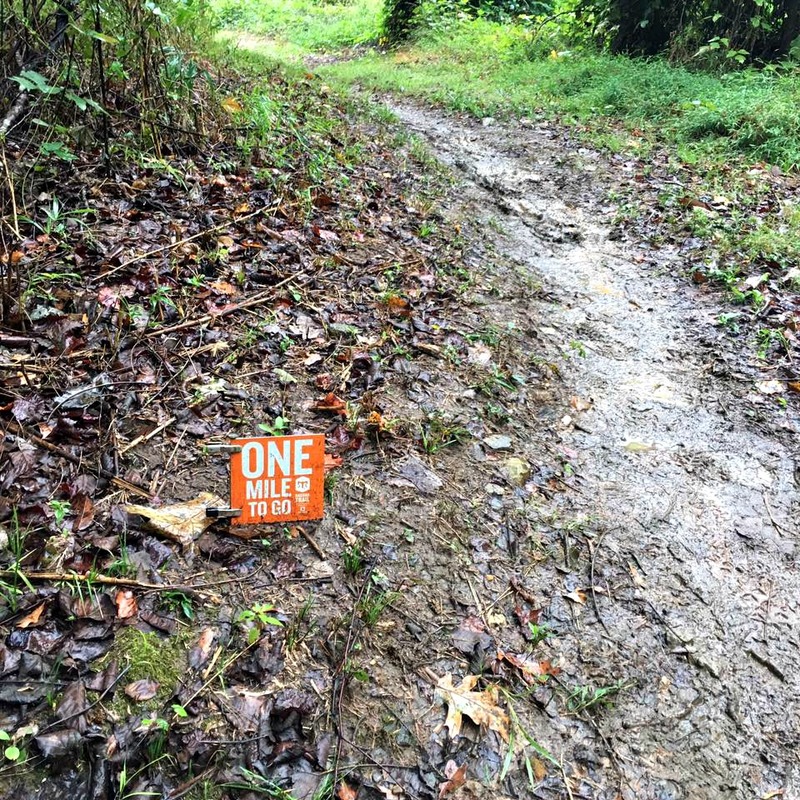 But this mud…this was the type that not even the best tread in the world could save you from. It was dangerously slippery, as was demonstrated by people falling down left and right. We passed the time trying to avoid stepping on the numerous frogs and toads that were now littering the sopping wet course…as well as avoiding slipping off some of the steep ledges led down to now raging streams. I wish I had more to tell you. 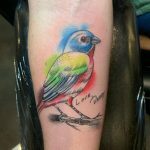 I wish I had more pictures to show. But the truth is, every single step taken on those trails was done with pure focus on trying not to fall. And that’s all I remember. Eventually, we made our way back to transition, where I handed off my bib to the next team member. I headed back to our campsite to discuss our plan with our team. But sooner did I get there, than the team member I had just sent out on trail returned, telling us that Ragnar had put a “one hour hold” on the race. But, rumor was cancelation was near. Winds had begun to pick up, and the relentless rain was only getting harder. I’m not a quitter, but…it was too dangerous out there. We checked in, collected our medals, and called it quits. We weren’t alone: hundreds of people began packing up in the pouring rain and breaking daylight in what seemed like a mass-Ragnar-exodus. Before the one hour hold was over, the race had been canceled. 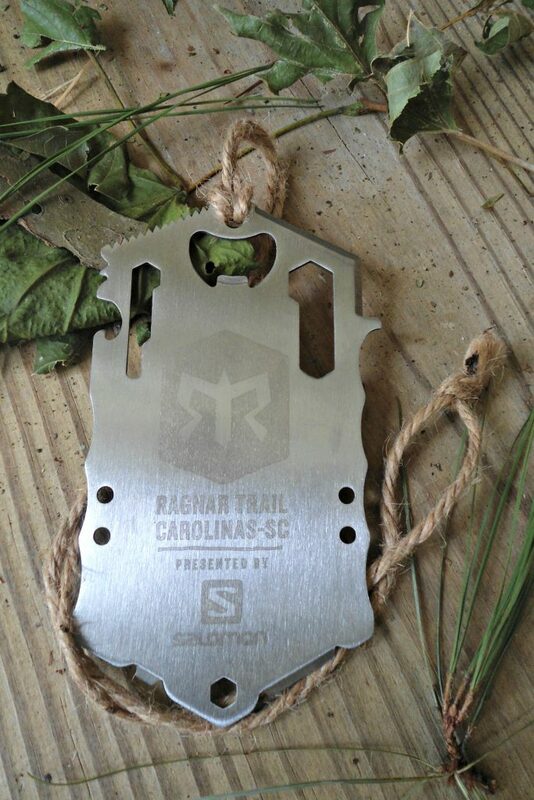 The Ragnar Trail medal…an incredibly sharp multi tool. 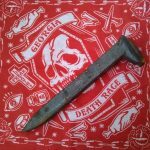 Not TSA approved. Cleaning up an 11 person campsite in the pouring rain and hurricane gusting winds is an adventure in and of itself. 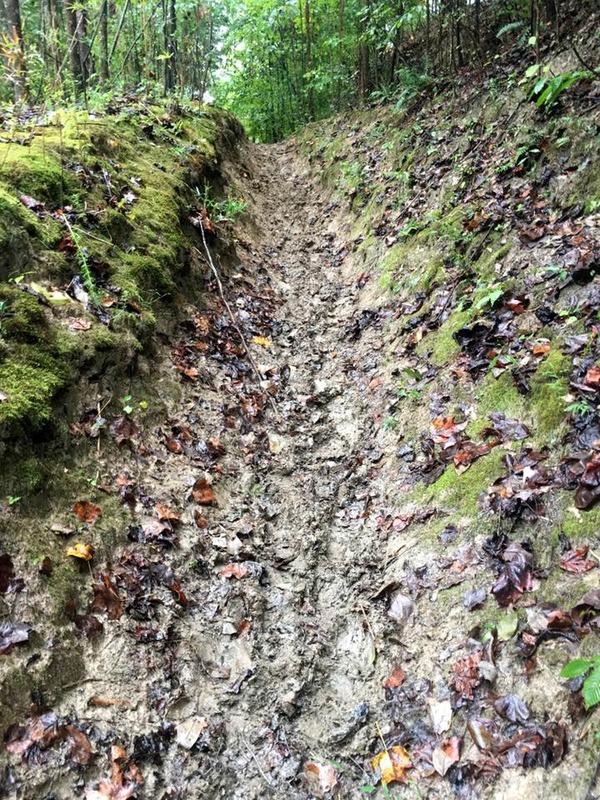 But we got it done, leaving not a single trace…other than a ton of muddy footprints. The rest of our day was spent trying to figure out what to do with ourselves. Driving back to the beach in the middle of a hurricane was not an option. There were absolutely no hotel rooms in Charlotte, as they were full of coastal evacuees. But one of our teammates found, and booked, a room in Florence, about two hours closer to our home, but still an hour + inland, so we headed there. What followed was a terrifying drive full of a ton of downed trees, downed power lines, flooded roads, and detours. We finally found aforementioned hotel where we sat in the powerless hotel lobby for 4 hours, before they could manually check everyone in. Once again stranded, Geoff and I had resorted to the idea of sleeping in our car in the parking lot of the hotel we had just been denied a room in. But as fate would have it, our group totally lucked out finding a room in a “Sleep Inn” right off of Interstate 95 that was in the middle of being renovated. It didn’t have power, but they had a $60 room for us, so the 8 of the adventurers that had stuck together wound up in one dark room for the night, spread out over the beds and floors. We were so incredibly lucky that we still had coolers full of camping food, as no restaurants or stores were open. 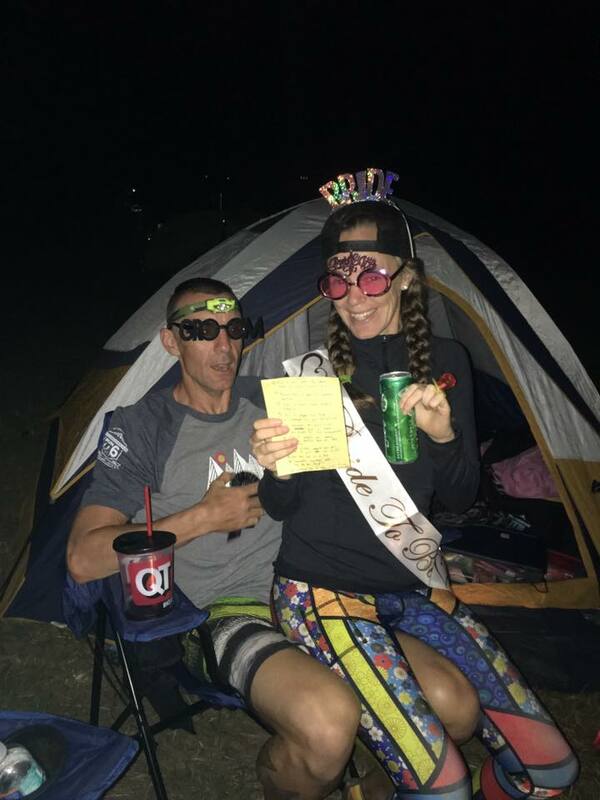 So we giggled by headlamp while eating Picky Bars and drinking the leftover beer from Ragnar, before finally drifting off to a surprisingly restful sleep. The next morning we somehow made it back to Myrtle Beach, despite more flooded roads littered with downed trees, and only one gas station open in a nearly 60 mile radius. So, here we are. 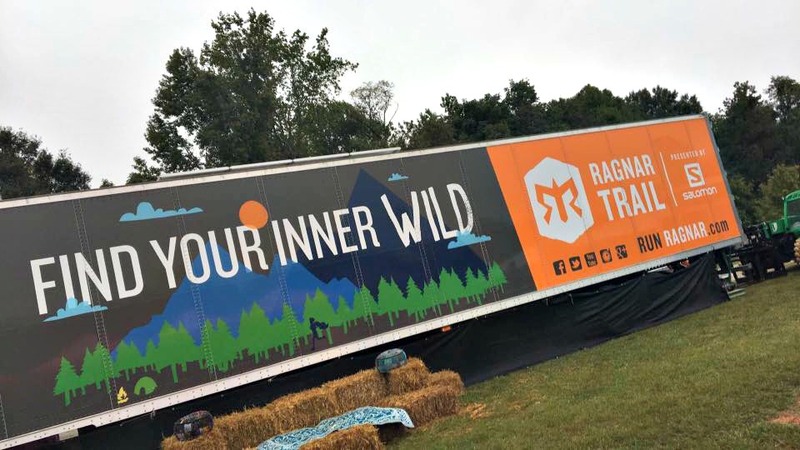 For years I have been interested in checking out a Ragnar event, and I feel very fortunate that we got the opportunity to do so. Initially, I was bummed at how everything turned out. We didn’t get a chance to hang out by the campfire (though a few of my teammates did, despite the rain!) 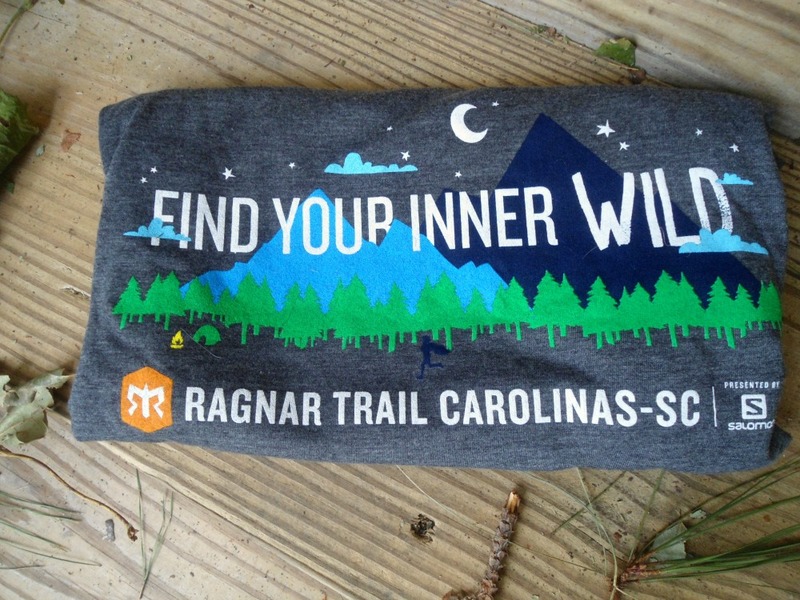 We didn’t get a chance to spend time in the village, relaxing in the ENO hammocks, drinking a beer in the beer garden, take a “Night Light Writing” photo, or do any of the really fun things advertised at a Ragnar Trail event. We didn’t cover all of our team miles (though all 5 of us each covered at least 3 loops). We didn’t get to cross the finish line as a team. But what we got instead was one hell of a bonding experience. Both of our Myrtle Beach teams were absolutely incredible. Everyone stepped up to fill in the mileage gaps left by those who couldn’t make it due to the storm. 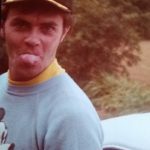 Everyone charged out into the rain and onto those trails without hesitation, without a single complaint…though any complaints uttered would have indeed been valid. Everyone took turns pacing each other, so not a single member of either team was out on that muddy, dark, sometimes dangerous course alone. Everyone shared their food, their drinks, their headlamps, their gear…everything. 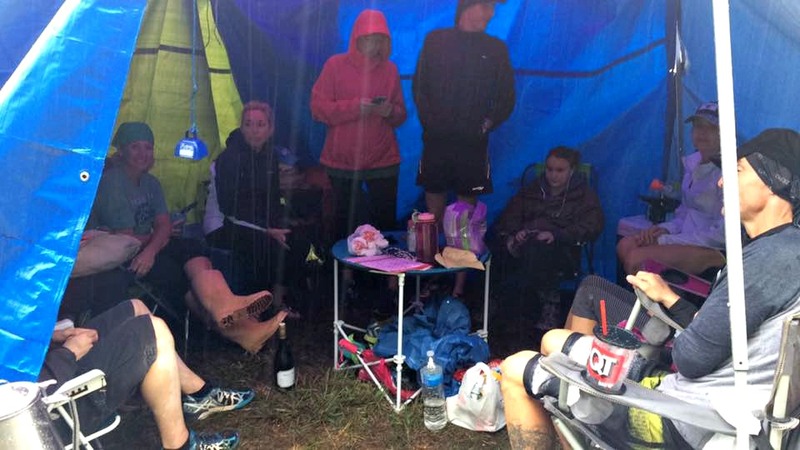 And everyone took turns cracking jokes, making sure our team moral stayed elevated, despite the miserable conditions during the event, despite leaky tents, despite being stranded with no where to go, despite sleeping on hotel floors. 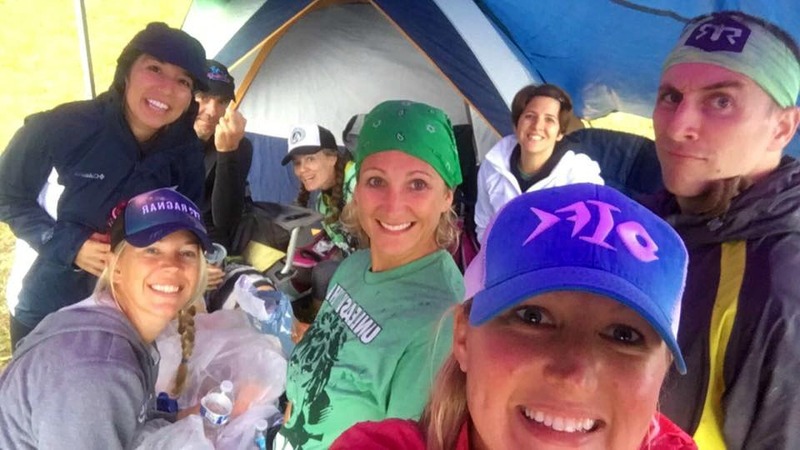 Our Ragnar experience wasn’t the sunny, outgoing event pictured on the website, full of smiling, costumed runners high fiving each other out on the course, or teammates bonding over beers and s’mores by the campfire at night. 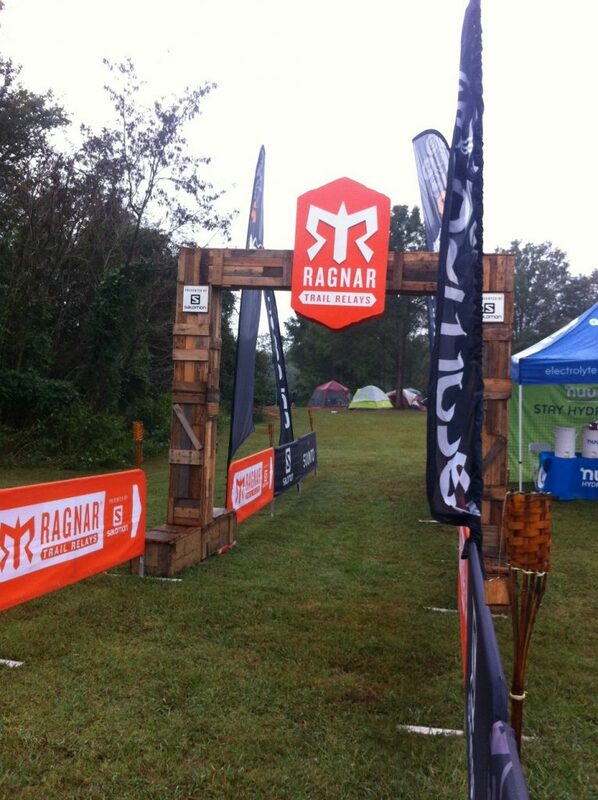 No, our Ragnar experience was wet, cold, smelly, soggy, and limit testing. Nothing went the way we expected it to. And in retrospect, it was absolutely perfect that way. Thank you Ragnar, for giving us a shot at this event, despite the impending hurricane. But more importantly, thank you Geoff, Paul, Raquel, Felicia, Julie, Emily, Daniel, Mikie, Sara, and Betsy for being incredible teammates, and more importantly, kickass friends. I love you all, I’m so incredibly PROUD of you all, and can’t wait for team Out of Bounds/Unleash the Hulk/Don’t Flex While Holding the Bread’s next adventure. Awesome recap! We were there too and had a similar experience. Although, we didn’t hear the rumor of calling the race until 8 am and by that point a few of our teammates had nearly injured themselves out there. I even felt a little uncomfortable running by those raging creeks with steep slippery muddy slopes. Our team (CocoNUTS) is going to head to Atlanta in the spring to try it sans hurricane. . Hope to see you there. P.S. No joke on the ride home, heading toward Charleston with all the downed trees and power lines had some of us questioning the seriousness of the situation we found ourselves in.